True story: I walked to my bank branch and booked an appointment with a financial advisor. I wanted to increase my pre-authorized purchase plan for my TD Canadian Index Fund – e series. I was not able do it by through EasyWeb. I figured why not get some help. Bad call. The financial advisor shook his head looking at the screen and flatly told me my fund was not doing well. Plus, he offered me to purchase mutual funds with higher MERs. I have said this before in my previous blogs – One of the dominant reasons for actively managed funds failing to beat index funds would be the high management expense ratios (MERs). Sadly, Canada has one of the highest mutual fund fees in the world. The financial advisor said he would be able to purchase mutual funds for me and get a better return than the index. He had some fancy charts to prove his points. It was a well-rehearsed sales pitch. I wanted to act polite but I giggled like a nine-year-old girl when she sees her crush. I excused myself and sprinted akin to Usain Bolt for my life. FYI: Call 1-800-281-8029 and speak with a TD representative if you have any problems with your e-series funds. In my case, I had to answer some questions the representative asked me through the phone and I was able to increase my pre-authorized purchase plan. I share this story because all bank representatives and financial advisors from all five of Canada’s big banks and most investment business have an incentive to sell their financial products. There’s a conflict of interest. Duh! Financial products such as mutual funds and line of credit (LOC) may not necessarily be the best fit for your long-term financial health but your financial advisor will try to sell it you anyways because of the bonus he/she might be receiving for the vacation at Maldives. I want to go to Maldives too. Paradise. 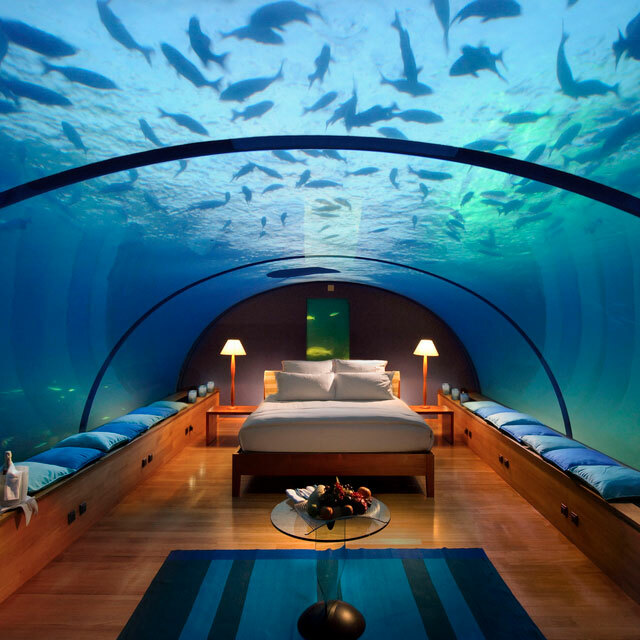 A room in one of Maldives’ resorts. Plus, he/she might even be getting a promotion. Some professionals in the industry are good people but as soon as someone gets paid by a company or big clients, the advice you receive will be biased. 5I research tries to eliminate that as only their members pay them, no one else. A couple of months ago, CBC made it clear employees at Canada’s 5 big banks was duping their customers. Now, if you are thinking where can I get conflict-free information about investment for regular people in Canada? Take a deep breathe. You are not alone. This is where 5i Research comes to your rescue and have answers for your investing and dividend questions. 5i Research is Canada’s only conflict-free investment research network. 5I is not affiliated in with any money mangers, brokerage firms, banks or public companies. Hence, zero bias. In addition, 5i research does not manage money. Despite their team consists of fully capable portfolio managers; they believe managing money while providing research is filled with conflicts. Another egg for biased advice. 5i Research is privately owned, with the majority owned by Peter Hodson, CFA, former Chairman of Sprott Asset Management L.P. 5i Research Inc. is also the owner of Canadian Money Saver, a fully independent financial magazine, published since 1981. How often will you get research reports? Reports will be issued frequently (about two per month). 5i research team will cover new issues, ETFs and structured products and individual companies will be covered on an on-going basis. Everything will be posted on their website, available to members. Again, 5i research does not manage money, which means they don’t try to sell you any investments. As a result, you are getting unbiased investment analysis and report. This is unique because every time Canadians get financial advice, the advice is inherently biased, as there’s usually some sort of bonus or compensation earned by your gorgeous advisor. I will end with this, straight from 5i Research’s website – “Well, the problem in the investment business is that everyone makes money off you, the individual investor. Since everyone is, um, scalping you, the advice you receive from everyone – except 5i Research® – is inherently biased”. Bold statement but very true. Where do you get your financial advice from? You are eligible to receive a FREE 1-year paid subscription to Canadian MoneySaver Magazine (No Strings Attached) by signing up for the free one month 5i Research Trial here. Full-Disclosure: Some of the tools that I personally use and recommend do have an affiliate link program where I receive a commission if you sign up using the links on my page. If you do purchase through my affiliate link, thanks a ton for your support! Previous Post Interview with Ellen Roseman, Business Columnist at Toronto Star. Next Post How Millennials Can Get Started With Retirement Saving?